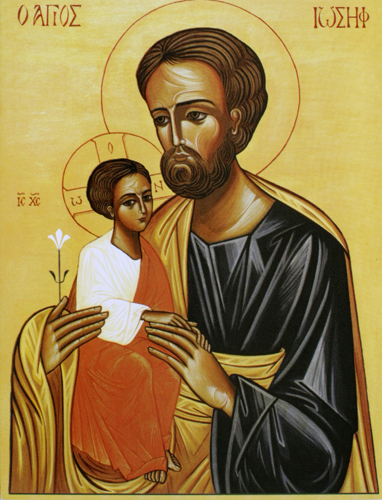 St. Joseph is largely absent in ancient Byzantine icons. Sr. Marie Paul composed this one faithfully following the ancient Byzantine style and colors. Joseph cradles and protects the Child, but does not embrace him. His hands seem afraid to touch his Son, but the Son reaches out to reassure him. Jesus sits on Joseph arm as though on a throne, appearing to weigh no more than a feather. Jesus’ white tunic symbolizes purity, and the crimson and gold of his robe symbolize royalty. The haloes indicate holiness. Christs halo includes a cross and three Greek letters for Ho On, “Who Am,” God’s name in Exodus 3:14. The red outline of each halo and of the letters is a sign of the human blood God has come to share and shed. The letters IC XC to the left of Christ are the first and last Greek letters of the two words Iesous Christos, “Jesus Christ,” while the letters at top read Hagios Ioseph, “Saint Joseph.” The gold leaf background symbolizes the divine light. Joseph’s staff flowering with a lily follows the miracle reported in the apocryphal Protoevangelium of James. It recalls the prophecy that “But a shoot shall sprout from the stump of Jesse, and from his roots a bud shall blossom” (Isaiah 11:1), fulfilled in the Messiah coming from St. Joseph’s royal line of David. Sr. Marie Paul was born in Egypt of Palestinian and Italian descent. Her Benedictine convent of French speaking nuns overlooks Temple Mount in ancient Jerusalem. Their icons help them provide room and board for young girls who attend their school. Copyrights are held by Editions Choisir of Geneva, Switzerland. The Printery House of Conception Abbey, Conception Missouri 64433 (1-800-322-2737) hold exclusive rights to print and distribute reproductions in the U.S.A.